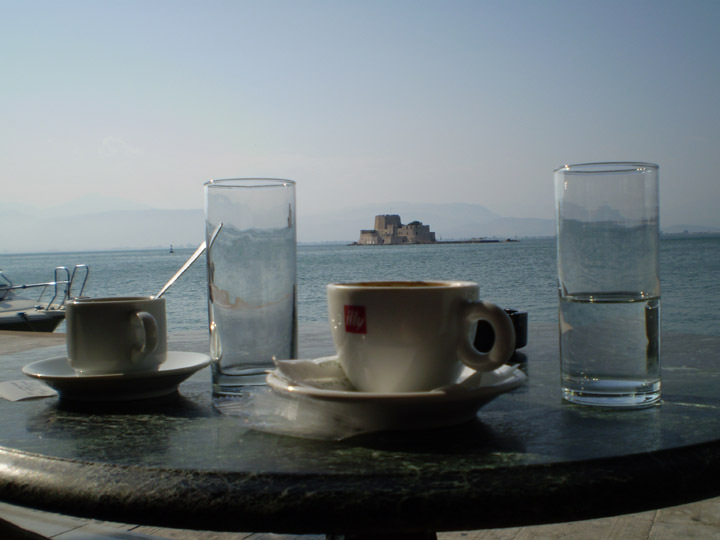 Nafplio (or Nafplion) is about an hour and a half drive from Athens. It stretches around a natural harbor and up along the abrupt coastal hills. The area has been populated for over 2000 years as can be seen in the Byzantine and Venetian fortress ruins. 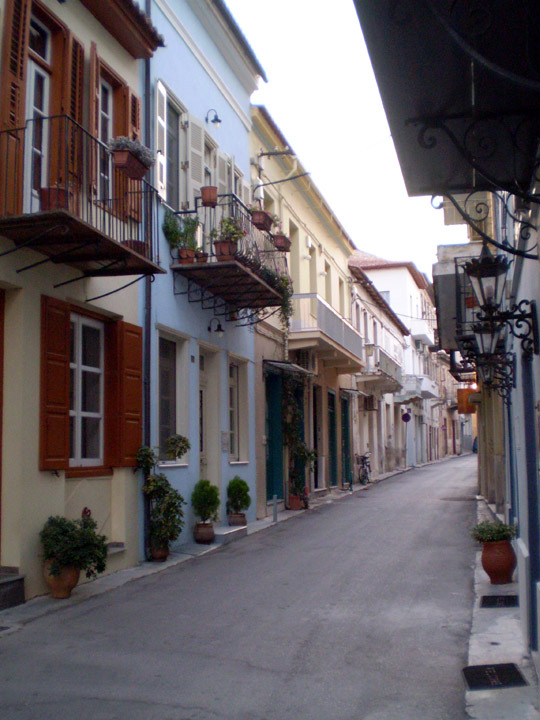 Nafplio was the capital of the first independent modern Greece nation in 1829. 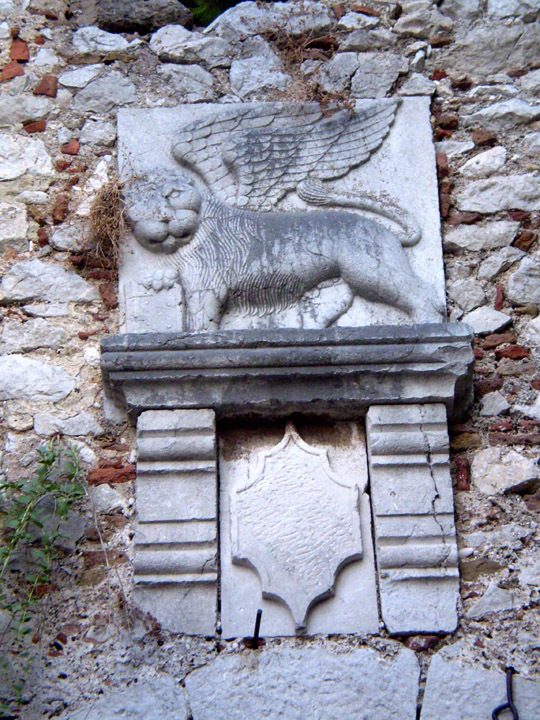 Traces of the city’s Venetian past within the fortress gates. I loved Nafplio because it was a quiet seaside town that seemed to cater to locals as much as to Greek or European vacationers. Neat, colorful homes and B&B’s blended into the narrow streets. For every jewelry or ceramic shop, there was a fishing supply store, bakery or grocer. During the twilight hours, locals and visitors alike enjoyed a drink and a stroll along the harbor. Lovely city streets with shops, inns and restaurants. One afternoon, we watched a concert in the central Plateia Syntagmatos (or Constitution Square) which was part of a festival. Children, with balloons tied to wrists so as not to lose them, danced and ran around. Later we followed others into a Greek Orthodox Church and watched quietly as families lit candles and reverenced icons all while chatting and laughing among themselves for a happy religious visit. 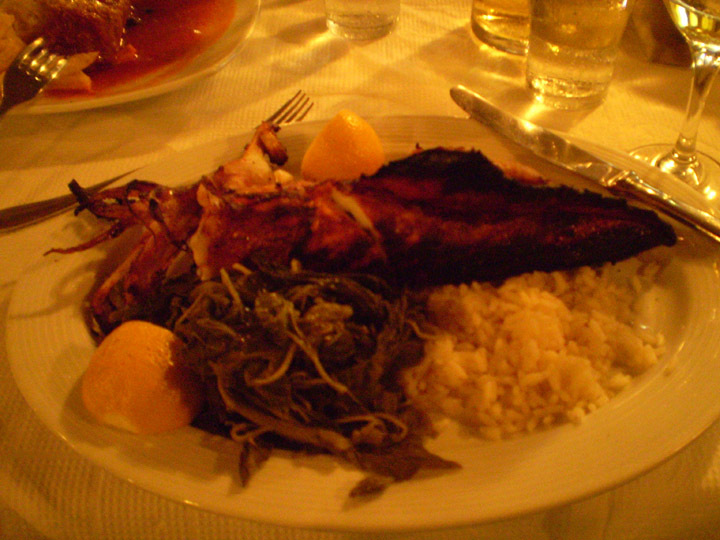 The food in Nafplio featured fresh seafood, simply prepared to better show off the local quality. In Early September, dining was definitely al fresco! Grilled squid, steamed local greens and rice with lemon. Simple but incredibly delicious! The geography of Nafplio provided excellent walks and small hikes up the steep hills which provided a great view of the city. From these hills, I also watched the sun set over the Peloponnese – a very suitable ending to a wonderful adventure on the Greek mainland. 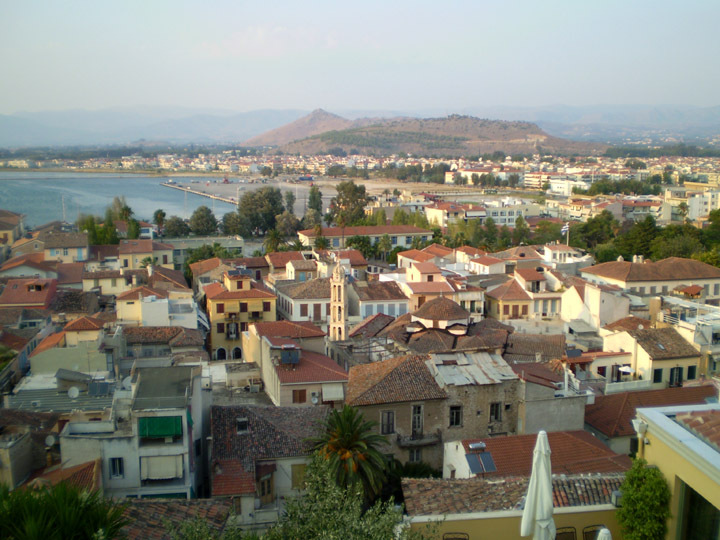 The rooftops of Nafplio and the harbor. 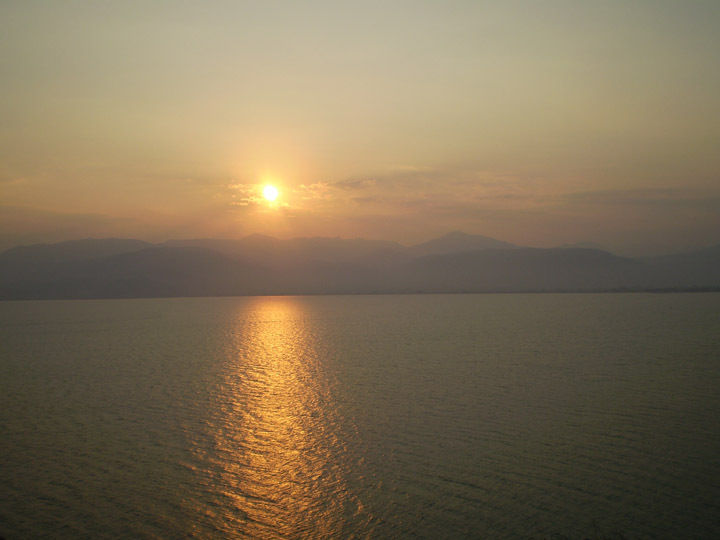 The sunsets are humblingly beautiful from the hills around Nafplio. I was wondering whether I can use your coffee photo above for my Facebook page ‘C is for Coffee’. The idea is to combine coffee, travel and photography. Basically just like in your photo. Obviously I can mention your name and the location where the photo was taken. Hope to hear from you soon and feel free to like the page. Thanks! Hi James – Sure you can post my photo to your Facebook group. (I’m a great supporter of coffee and travel!) Please credit DaydreamTourist.com and it would be great if you could like to my post. Thanks!